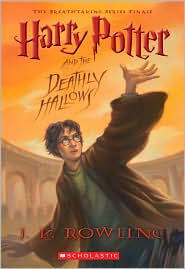 Harry Potter and The Deathly Hallows is the last book of J.K. Rowling's amazing YA Fantasy series and although it is the one with all the answers and it provides an incredible finish, it is not necessarily my favorite. The story picks up right as Harry is about to turn seventeen and the protection spell that has been keeping him safe throughout the years is about to expire. A rush by the Order of the Phoenix to keep him out of the hands of the Death Eaters and away from Voldermort is on... and the book begins with a bang! Lots of action, permanent changes and more losses for Harry. As the powers of the Dark Lord gain strength so does his power over the Ministry of Magic, life deteriorates for the general population and specially for Harry's friends and the Order of the Phoenix. Muggles, muggle born magicians and their friends are particularly in danger and begin to disappear. In the meantime, Harry, Ron and Hermione stick to Dumbledore's plan to continue searching for Horcruxes in an attempt to weaken and destroy you-know-who. Terrible stories and rumors about Dumbledore and his family circulate and Harry begins to doubt Dumbledore's real intentions, his love and true character. Once the three friends are forced to leave on their journey, the story meanders with Harry, Ron and Hermione going from pillar to post trying to figure out things without much success. 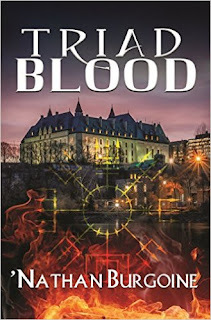 Of course, everything they do and the little they do find out has a purpose and eventually it all makes sense and becomes part of the big puzzle, but in the meantime the whole process slows down the pacing in this story to a crawl. At this point, the book becomes a tough read for quite a while and this is a long book... but once you get past that, the fun begins again. I do recommend that during this slow time, even when tempted, you not skim because you'll miss important details as Harry chooses between what is right and what is easy once the Deathly Hallows come to light. The pace picks up during the second part of the book as the pieces of the puzzle begin falling into place. This is a re-read for me, and it still amazes me how Rowling ties up so many threads and uses seemingly insignificant details from all the books in this series to come up with the final answers. I must admit to being a bit disconcerted about those answers in the end. They were quite "brilliant" actually... brilliant in their simplicity and always there, really. But I know I didn't figure out those answers until I read them, and that I really appreciated. What else did I love about the book? The characterization. How can I not appreciate character growth and development? I figure when you feel as if you know characters inside out by the end of a series, that's great development and that happens with more than just the central characters in this series -- Dumbledore and Severus Snape are great examples. Secondary characters are so incredibly important to this series' great success. In this book, Neville is also one of those minor characters whose growth I most noticed and appreciated. He is such a key character and one I think is often overlooked. The second part of the book is action packed, there's a great battle with sad losses and great victories, all of it quite spectacular. In the end I couldn't help but feel for Harry... all those losses and all that sacrifice along the way from childhood to young adulthood. I wanted happiness, peace, love and a family for him, he deserved that and more. Rawling does give the reader a glimpse into Harry, Ron, Hermione, and Ginny's futures that I found sweet and a little nostalgic. A classic young adult series, no question about it. Brilliant! I started re-reading the first Harry Potter this week. It's been so long since I've read any of the books that after I saw the latest previews for the Deathly Hallows movie part 1 I was inspired to re-read some Harry Potter! While Deathly Hallows was over all a disappointment to me, it was full of wonderful action adventure and of course all those beloved characters. MsM yes! My husband and I were watching HP and The Halfblood Prince and previews for the new movies and that's how this re-read happened. I agree with with you about this book, it's not the best in the series, but yes... those wonderful characters! And it IS the end of the series. I enjoyed revisiting them. I am a huge Harry Potter fan! Have all the hardcovers and everything. This was not my favorite book in the series, but I still appreciate it. I know that I am going to re-read this before the next movie comes out! Thanks for the review. I enjoyed it! It’s not hard to see why J K Rowling is so popular among the readers. She is a different kind of magician who knows how to infuse a soul into the story. Fantastic review Hilcia! And that's one big book! Anonymous, you are so right. This series was magical. LOL, can you imagine, Hils? I've never read them and haven't sit down to watch the movies. I must be the only one in this world LOL. Never read the books but enjoyed the movies and the video games. :) I do think the books are great since they got so many kids into reading. And I must get on with my book! Oh wow, nath! You've missed out on some great, classic characters... I loved the books and so far, the movies too. I read these for me and my husband who is addicted to HP so I could give him the mising details that were not included in the movies... can you believe it? LOL! I'm so jealous that you read.. I mean re-read this one. LOL. You know it's my Big Book Challenge Book... not to mention my kids nag me at least every other day to read it. But I PROMISED my 11 year old that I would read it this month. Since most of the HP books were released in Augusts every year, I am hoping it will get me in the right mood to read it. I love whole series, this book is of course very nicely crafted though my fav is 6'th. Mandar, I'm glad you enjoyed it. Reading this series the second time around is just as powerful, isn't? And yes, you're absolutely right! All the books are well crafted. Like you, I also love, just love HP and the Half Blood Prince. And yes... now we're ready for the movie (1st part anyway) -- wonder what it will cover?